The HP Laserjet Pro M452NW is a colour laser workgroup printer suitable for micro or small office that has heavy printing needs. The dimension of the printer is 412 x 469 x 295mm. It weighs 18.9kg which is heavy enough that one might want some help moving it from one place to another. With HP Laserjet Pro M452NW toner cartridges, the monthly duty cycle for the printer is 50,000 pages. The printer features a 2-line backlit LCD display which makes it easy to setup and manage. It comes with 250-sheet input tray and 50-sheet multipurpose tray. It supports a wide range of media types such as bond paper, envelopes, glossy paper, labels, photo paper, plain paper, postcards, preprinted paper, punched paper and recycled paper. The printer uses HP ImageREt 3600 image enhancement technology for high-quality images.The printer comes with excellent security features that protect it from unauthorized access. It has the ability to print professional quality black or colour documents quickly. It allows users to connect directly to a PC with a USB cable, or to the network router either wirelessly with WiFi or with an Ethernet cable. The input capacity of the printer can be increased from 300 pages to 850 pages with the optional 550-sheet tray. Fast two-sided printing is possible with HP Laserjet Pro M452NW toner cartridge. Users can easily print from smartphones or tablets as the printer supports Google Cloud Print, HP ePrint and Apple AirPrint. It is quite big and heavy. The printer is single-function device limited to print tasks only. 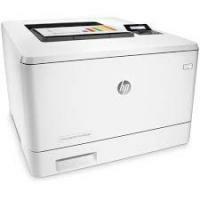 The HP Laserjet Pro M452NW printer is a decent option for a demanding business. The printer comes with excellent security features. It has the ability to print professional quality black or colour documents quickly for heavy demanding applications. Q. Do your compatible HP Laserjet Pro M452NW toner cartridges also come with a warranty? A. Yes, all our toner cartridges come with a warranty from any defects. In case you face a problem with any of our products, please feel free to contact us on 048 30833221 or email us on info@printerinkcartridges.ie regarding your issue, within 30 days of receiving your item and we will be glad to help you. Q. Do you also provide paper for this printer? A. Yes we also provide paper for your printers to print on. You can find our whole range of paper media here. Just make sure that the paper you buy fits the paper specification guidelines mentioned by your printer so as to avoid any paper jams or other damage. Q. How do I save on my colour toner cartridges using my HP Laserjet Pro M452NW printer? Open the printer driver and click on “Preference” or “Properties”. Click on the “colour” tab and select the “HP EasyColour” checkbox to clear it. Select the “Print in Greyscale” option and click “OK’. Now your printer will not print coloured printouts to save on coloured toner. Q. Are there HP Laserjet Pro M452NW toner cartridges of colours other than the ones given on your website? A. HP Laserjet Pro M452NW toner cartridges are only available for purchase in magenta, cyan, yellow and black. This is due to the fact that HP Laserjet Pro M452NW printers use the CMYK (cyan, magenta, yellow, black) colour model for printing. These are primary colours that enable the printer to make all other colours, hence more colours are not available for this printer. Q. I need a heavy duty printer for my office. Is the HP Laserjet Pro M452NW printer a good choice for me? A. Yes, an HP Laserjet Pro M452NW printer is a great choice for you as it has a monthly duty capacity of 50,000 pages. This means you do not have to worry about exceeding the capacity of this printer. Q. How can I check when my HP Laserjet Pro M452NW toner cartridges need replacement? A. When you observe low ink level warning messages and the indicator shows low ink levels, consider having the replacement cartridges available to you to avoid possible printing delays. You do not need to replace the cartridges until you are prompted to do so. Many HP printers display their ink and toner cartridge levels on the control panel. Look for an ink drop or cartridge icon or an ink level menu to check the status of each cartridge. Q. What if there is no print option available on my Android device to print directly from my phone? A. For all the Android phones with version v4.0 to v4.4 devices (except for the Samsung devices and some of the HP mobile devices), a print option might not be available. In such case install the app of HP ePrint from the Google Play store or some other android app providers, in order to print with Wi-Fi Direct. Q. How much will the shipping cost me, if I order HP Laserjet Pro M452NW toner cartridges from this site? A. Our courier partners Fastway Couriers make great efforts to deliver your product on time, thus except some charge for the items shipped. The delivery charge of the product starts from €1.99 inc. VAT which gradually increases depending upon the weight. Q. Is this printer compatible to be used in small offices with heavy printing jobs? A.Yes, the HP Laserjet Pro M452NW works absolutely fine to perform heavy printing jobs and has the ability to print professional quality documents quickly and easily. The printer uses HP ImageREt 3600 image enhancement technology as an added functionality to produce high-quality images easily, which improves the overall printing performance. Q. Will the use of a compatible range of HP Laserjet Pro M452NW toner cartridge spoil my printer? A. It is unlikely that the cartridges supplied on this site will spoil the printer. The only case where a printer can get spoilt by a cartridge is that if it uses substandard parts, uses incompatible toners or is not tested and cleaned thoroughly before refilling.